October 17, 1926: “The Gumm Family” performed at a George O’Brien Dinner in their hometown of Grand Rapids, Minnesota. October 17, 1938: Judy filmed the reprise of “Over the Rainbow” for The Wizard of Oz. The scene was cut from the film. It was a part of the sequence in which Dorothy is trapped in the Witch’s castle and is crying for her Auntie Em, just before she appears in the crystal ball. It was decided to have Judy sing the reprise live on the set with piano accompaniment only (Roger Edens was at the piano), rather than lip sync to a pre-recording, due to the emotional nature of the scene. 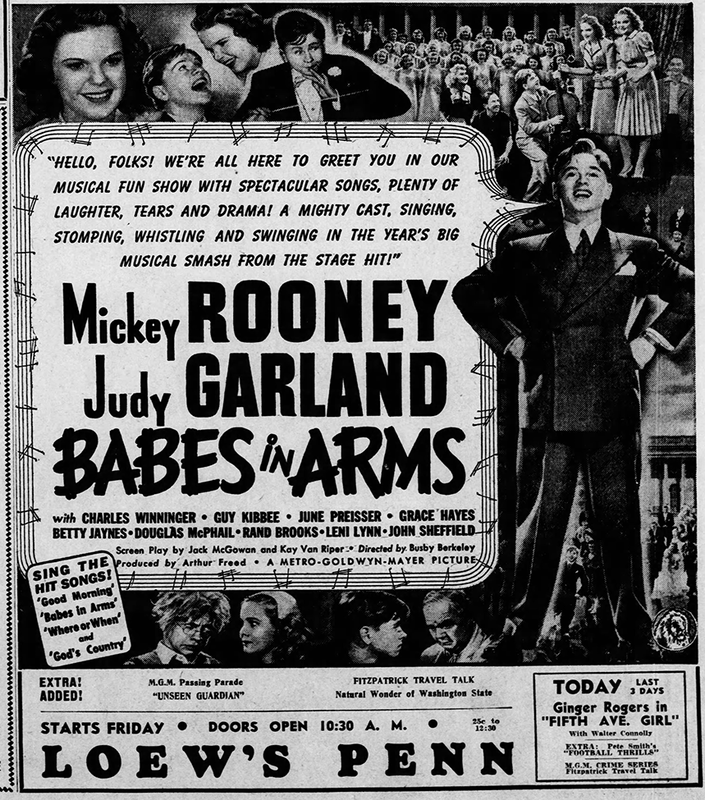 Months later, Judy had to refilm the scene due to the changes in the costumes after these early weeks of filming with the blond Dorothy. The orchestral background music was not recorded until May 1939. All that exists is the audio to this earlier version. Our buddy Mark Milano has put the music and visuals together, along with “Hail! Hail! The Witch is Dead!” and the alternate audio for the film’s ending (see above). 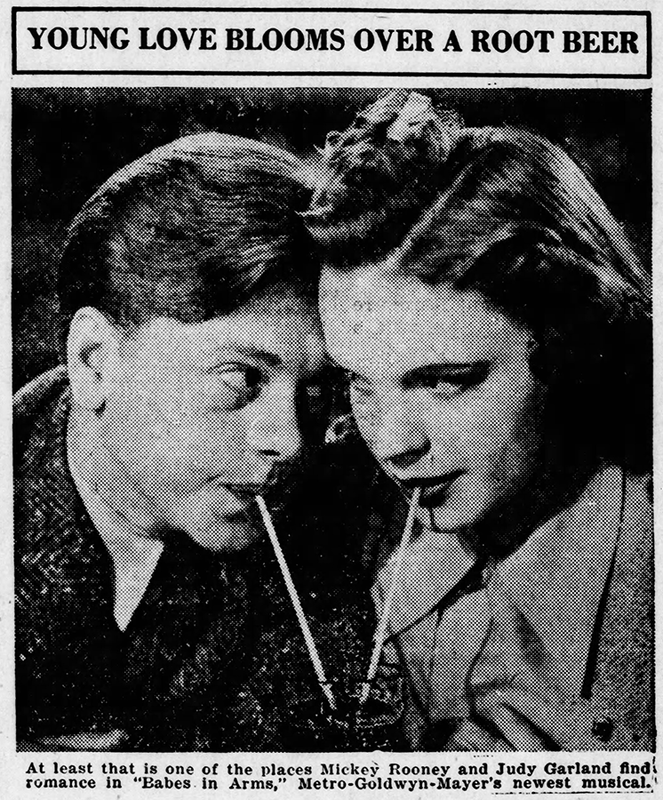 October 17, 1939: Judy appeared on “The Pepsodent Show Starring Bob Hope” aired by NBC-Radio out of Hollywood, California. 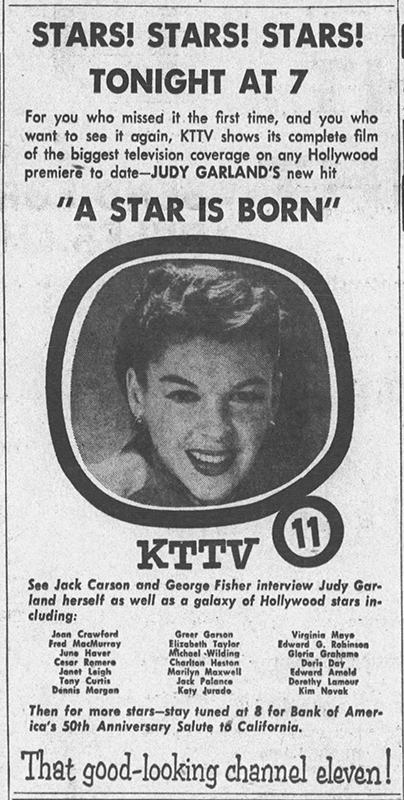 This was Judy’s regular weekly appearance on the show, although she had missed the previous two weeks’ shows due to her schedule at MGM. 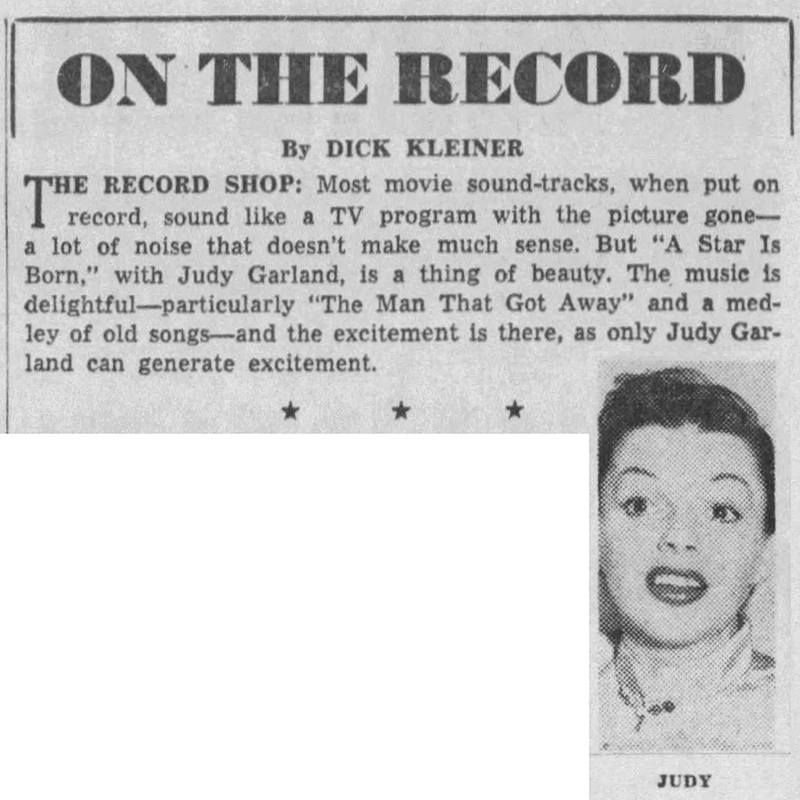 It’s unclear what Judy sang, and no recording of this broadcast is known to exist. 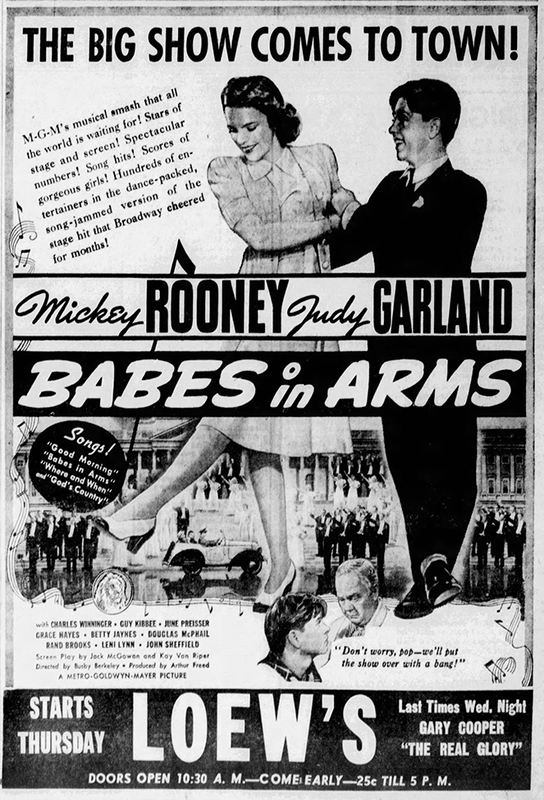 Meanwhile, Babes in Arms was set to open across the country. It became one of MGM’s biggest hits, bringing in tons of revenue for the studio. 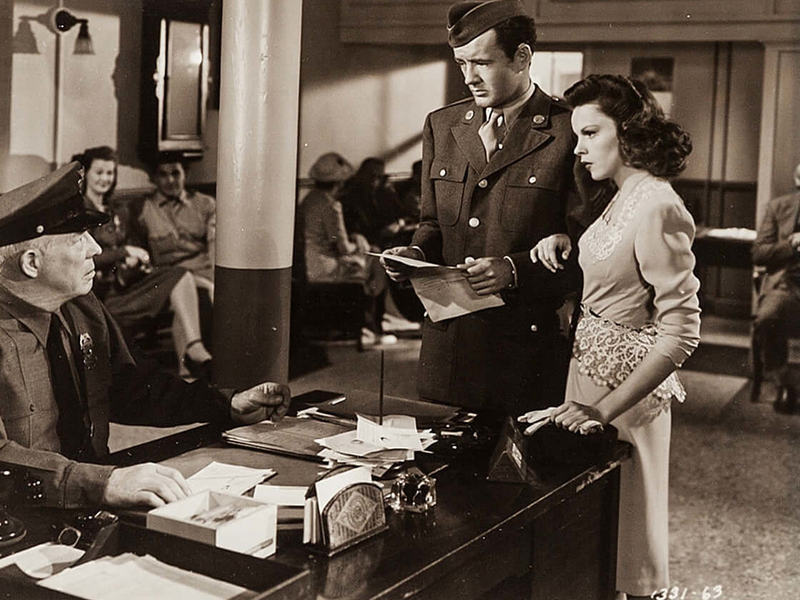 October 17, 1944: Filming on The Clock continued with scenes shot on the “Interior Marriage License Bureau” set. 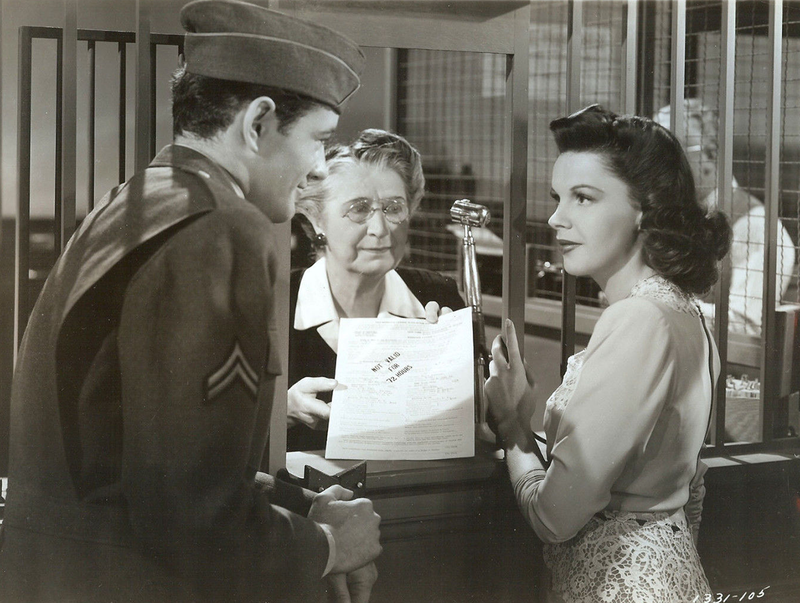 time called: 10 a.m.; dismissed: 5:50 p.m.
October 17, 1945: Judy had a rehearsal of “Who” for Till The Clouds Roll By. Time called: 1 p.m.; Judy arrived at 2:15 p.m; dismissed: 3:45 p.m.
Judy Garland sang vaudeville back onto the Palace stage Tuesday night and took one of entertainment history’s most glittering audiences by storm. For an hour and 15 minutes – the entire second half of a show brilliantly fashioned to bring back the fabled times of “two-a-day” – Judy sang to a house jammed with show folk and celebrities as only Judy can sing. When it was over they stood and cheered her and watched happily as basket after basket of flowers came up on the stage. Outside the Palace, the one-time vaudeville Mecca now renewing the old “two-a-day” policy for the first time in 18 years, police lines held back thousands of people who balked Times Square traffic as they stood for hours to catch a glimpse of the stars. Whatever they saw, they missed the real show. The real show went on inside before an audience that shouted approval for every number Judy sang. She sang, it seems, all of her wonderful songs; yet she could have sung twice as many, and no one would have stirred. Seldom as an audience seen Judy Garland so beautiful and radiant as she was Tuesday night. She did one or two production numbers with eight friendly guys (“Judy’s Eight Escorts”) and suffered a foot slip that almost matched the pratfall she took when she opened at the London Palladium last summer. At one point, she lost a rakish hat she was wearing, grinned, said “wait a minute,” picked it up, and went on with a song. 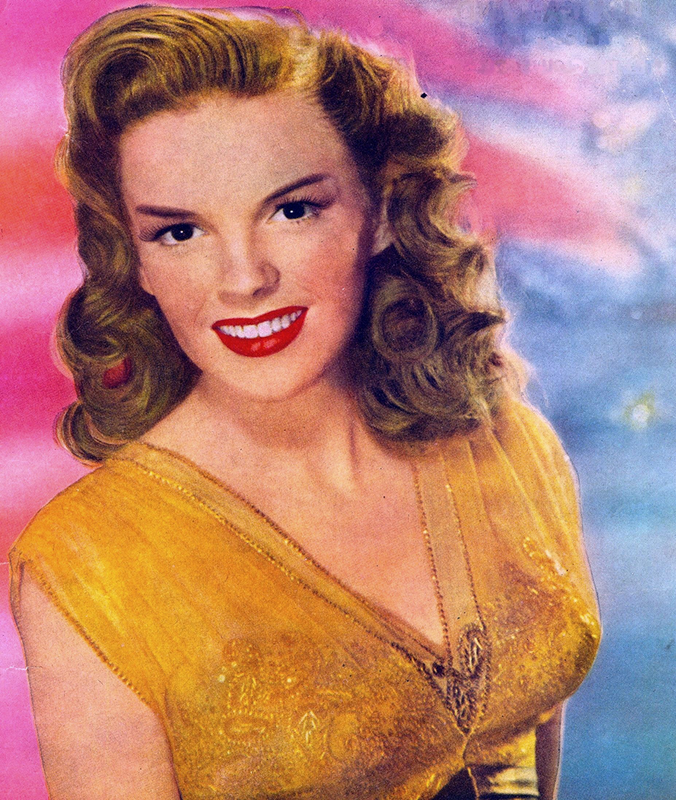 To say that the rest of the acts, which will accompany Judy for at least four weeks of two shows a day at the Palace, were equal to Judy would be unfair to everybody. But they were fine, too. They included, in the true vaudeville traction, Joe Smith and Charles Dale, still growing through their hilarious “Dr. Kronkhite” routine after 50 years on stage together. The Langs, a sextet of terrific acrobats; Doodles & Spider, two energetic and comic pantomimists; Gisela and Francois Szony, a truly marvelous brother-and-sister team from Hungary, and Max Bygraves, an unaffected and affable young English comedian. It’s the kind of thing you want to see over and over again. That’s the good thing about vaudeville. You can. 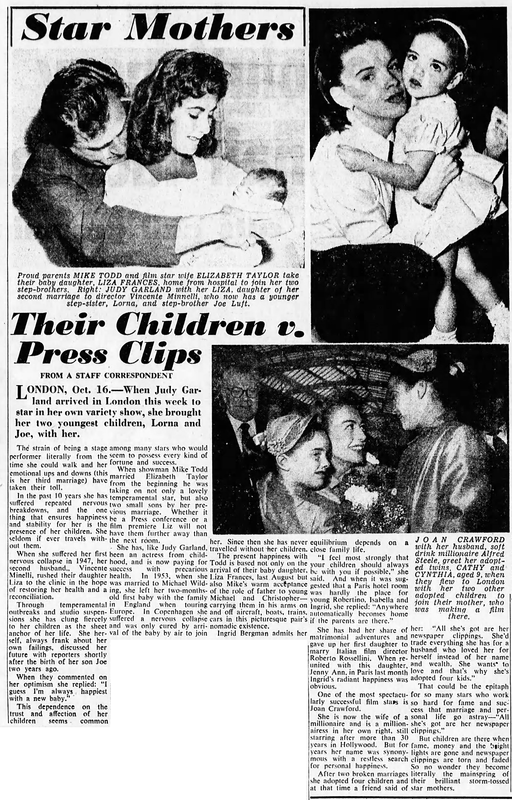 October 17, 1954: While in Chicago for the Chicago premiere of A Star Is Born. 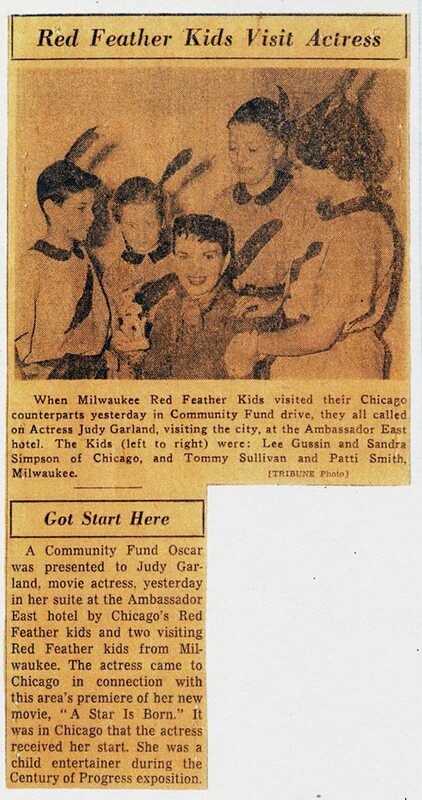 Judy had a photo op with the Milwaukee Red Feather Kids. 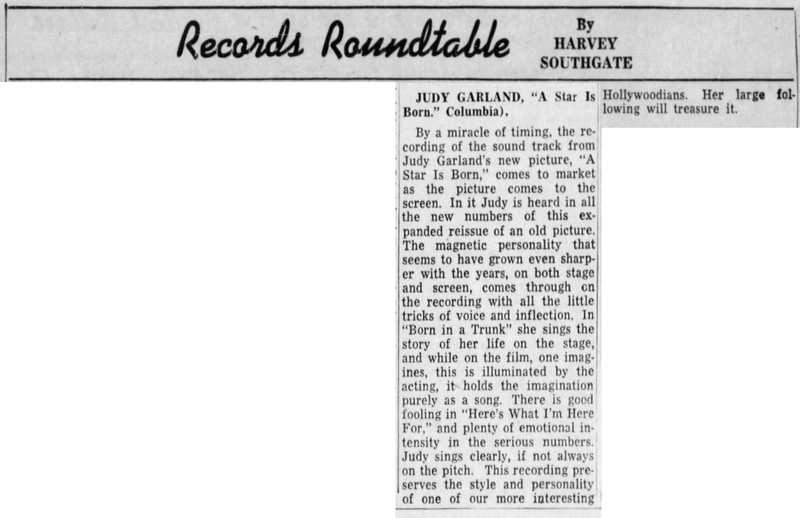 Note how the blurb states that Judy got her start at the Chicago World’s Fair. Scan courtesy of Kim Lundgreen. Thanks, Kim! 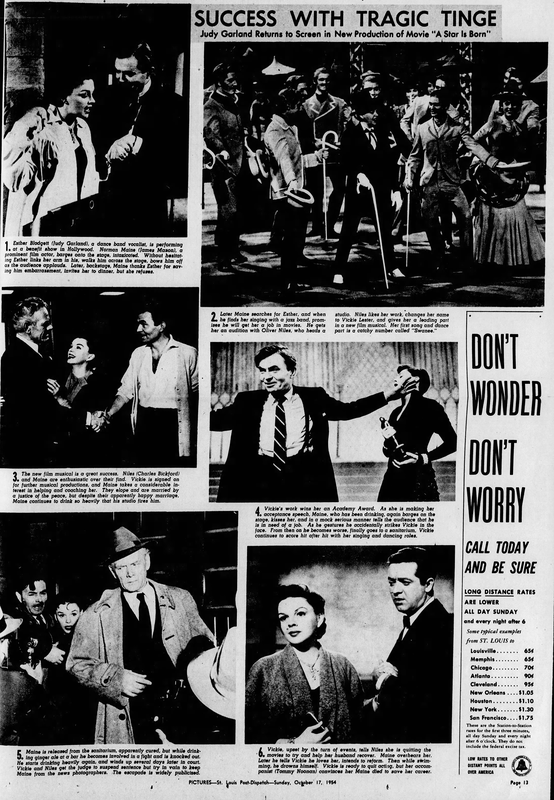 October 17, 1954: Miscellaneous A Star Is Born items. 2) A full-page photo spread from the St. Louis Dispatch. 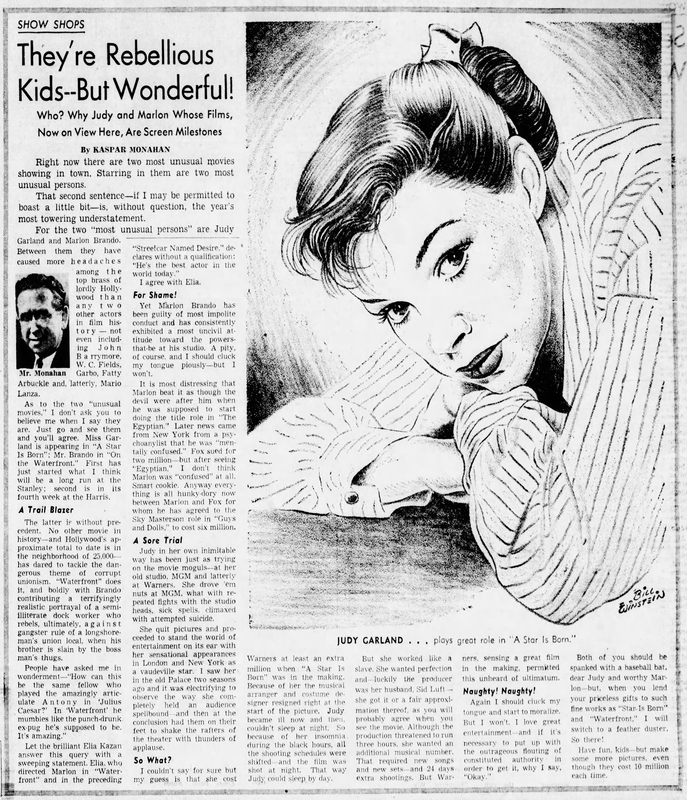 3) The Pittsburgh Press published an article about Judy and Marlon Brando being difficult but worth it, with a great sketch of Judy. 4) KTTV in Los Angeles was re-airing the coverage of the film’s premiere. 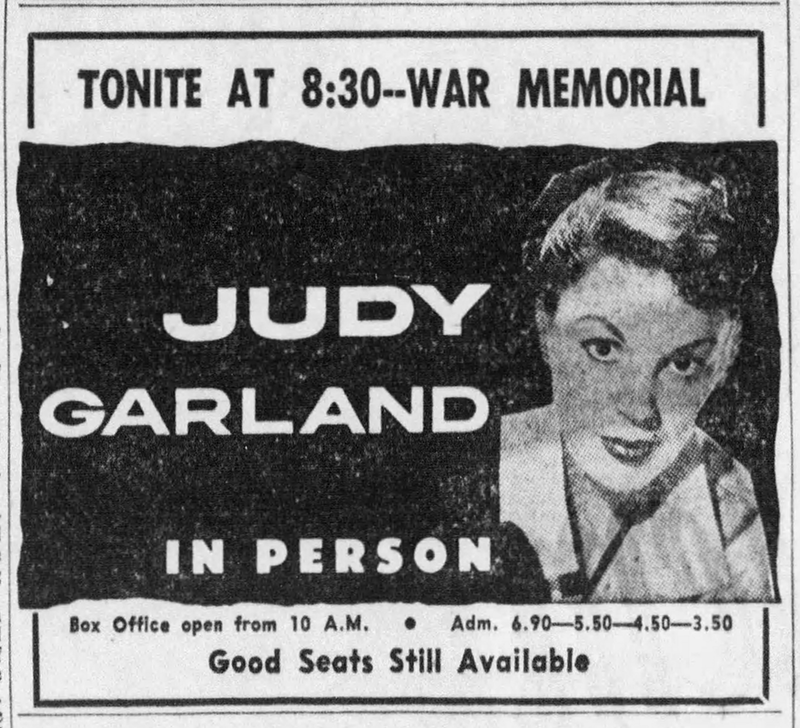 October 17, 1961: Judy was in concert at the War Memorial in Rochester, New York. After the performance, Judy played cards all night the caught a 6 a.m. flight to Pittsburgh. She slept all day on October 18 upon her arrival. October 17, 1966: Judy was seen with Peter Carlyle at Jack Jones’ opening at Coconut Grove.